accepted by any authority, guaranteed. 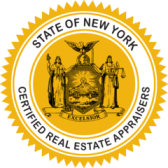 e provide certified real estate appraisals that meet and exceed the reporting standards and requirements of numerous private and government organizations. "...knowledgeable, honest and very helpful..."
ur experience with Appraisal Source was excellent. Starting with the initial phone call, the appraiser was knowledgeable, honest and very helpful. The appraisal was thorough, professional and the finished documents were exactly what our town required. Our appraiser was very reliable, answered all our questions and helped us understand all aspects of the appraisal process. We have recommended Appraisal Source to several of our friends and all have been extremely satisfied."